Hosting a luxury dinner party doesn't mean you have to spend all your time in the kitchen or spend a ton of money. This is how I like to celebrate the season and enjoy the end of summer with family and friends. For the third Project Food Blog challenge I put together a dinner party showcasing the last of the summer produce. Most of the ingredients are from the kitchen garden, the local farm stand or wild harvested. This menu showcases my favorite summer foods: tomatoes, sweet corn, and basil. 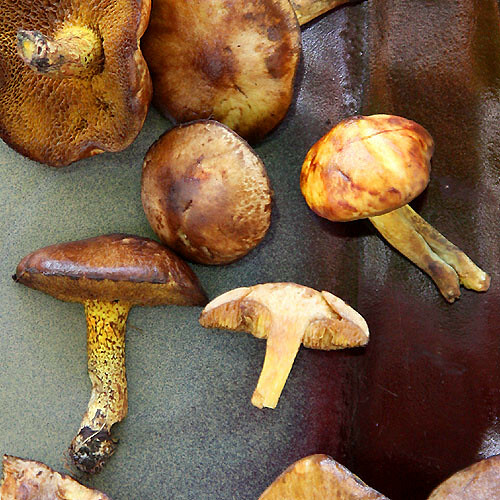 Plus some goodies that are available for a very limited window like hickory nuts, bolete mushrooms and wild onions. The key to this dinner party is the food can be made in advance so that it only requires quick assembly and some heating. That way I can spend more time with my guests and less time in the kitchen. 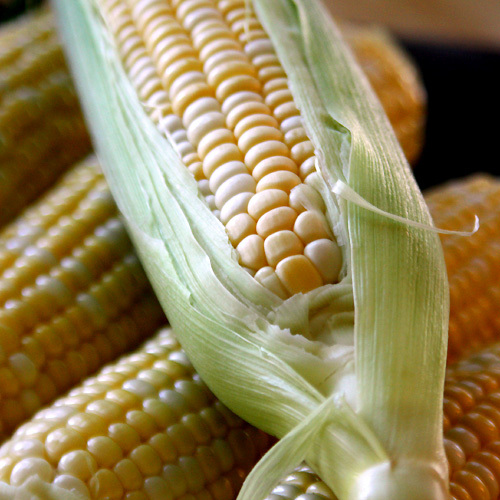 We'll start our dinner with a small bowl of light and creamy corn chowder made from the last harvest of summer sweet corn. This dish can be made a couple days in advance and held in the refrigerator. The chowder even improves over night. To serve, simply reheat it gently on the stove. Do not let it boil or you'll risk curdling the milk. 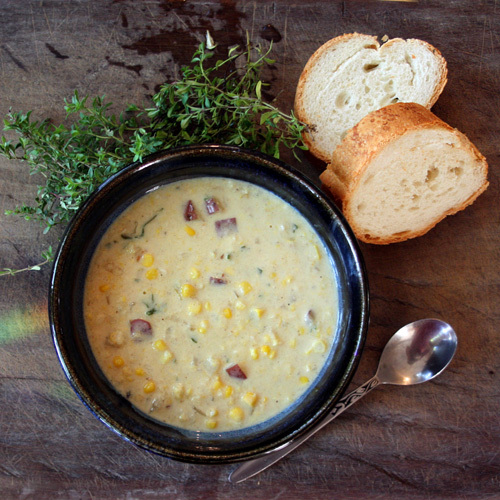 Here's the link for the recipe: Summer Sweet Corn Chowder. Two small slices of bread satisfy without filling up the guests. They need to still have an appetite for the main course. Although I think if I just served the corn chowder people would be happy. It is amazing. Even if you don't throw a dinner party you should make it. The main course is hickory nut basil pesto with roasted cherry tomatoes and a side of bolete mushrooms sauteed in butter. The basil is starting to look yellow and peaked now in the garden. We have time for one last round of pesto. To make the main course a little more local I opted not to use pine nuts. Lately pine nuts have been really expensive. I've been paying about two dollars an ounce. Apparently there was a bad harvest somewhere that is driving the price up. Local nuts are a less costly option. Locally there are lots of shag bark hickories. During a recent camping trip we collected a bucket full of nuts and cracked them open. I toasted a cup worth of them in a dry pan on the stove before using them in the pesto. They are bitterer than pine nuts, but they still have the buttery flavor. 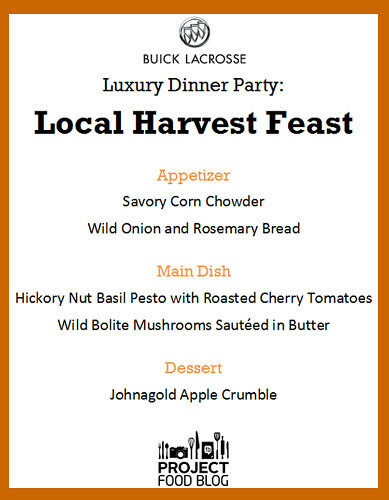 It was a nice change and perfect for this local harvest dinner party. You can make the pesto up to two days in advance and store it in the refrigerator, but the pasta should be fresh. Use an angel hair or other thin pasta because they cook in under ten minutes. 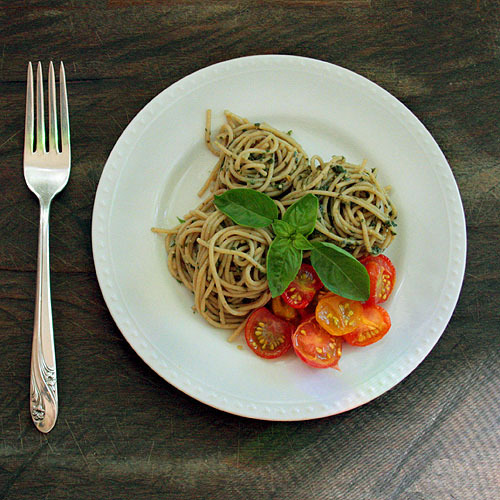 Here's a link to the recipe: Basil Pesto. While you are waiting for the pasta to boil put cherry tomatoes cut side up on a cookie sheet, sprinkle them with kosher salt and pop them in a hot oven for ten minutes or so until they start looking wrinkled. This will make them less watery and intensify their flavor. Serve them nestled on the side of the pesto. The cherry tomatoes are the variety 'Sweet Treat'. They have amazing flavor and are quite sweet. I would consider handing them out at Halloween but I don't think they'll last that long. To go with the pesto Jeff found the perfect side: wild bolete mushrooms among the leaf litter under a pine tree. Rather than mix them into the pasta where their flavor would be over shadowed by the basil, I opted to simply saute them in butter and serve them in a small bowl by themselves. What a treat! These are really delicate mushrooms so simply clean and prepare them ahead of time, then saute them briefly in a pan with butter before serving. 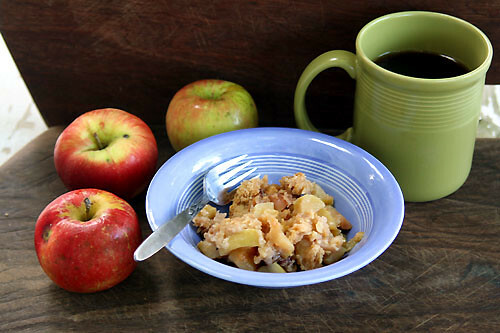 For dessert, a simple apple crisp with sassafras tea. I picked some apples off the Johnagold tree outside my office a couple weeks ago. These are great apples. They bridge the gap for good eating apples and good baking apples. They have a nice crunch and tend a little to the tart side. I made them into a quick apple crisp. You can make the crisp a day in advance, just keep the topping and apples refrigerated sperately and put it together right before baking. It takes about 40 minutes to cook. Put it in the oven when you serve the main course. That way it will be wonderfully fresh and the smell will permeate the house right about the time you are ready to serve. Make sure to allow at least five minutes for the crisp to sit. It should be warm, not scalding. Here's the recipe for Apple Crisp. Instead of offering coffee I decided on a local option, sassafras tea. It has a mild root beer flavor and is the perfect match for apple crisp. Make the tea in the morning and reheat it before serving. 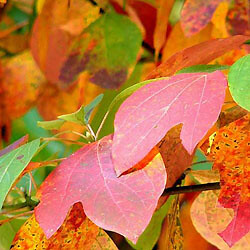 Find the recipe here for making sassafras tea with fresh roots. What a lovely evening. It was a perfect way to celebrate the end of summer. This is my entry for the third Project Food Blog challenge! I hope you liked it, and if you did, become a follower of my blog by clicking the “follow” button in the right hand column. If you are a Featured Publisher at Foodbuzz, please vote for me. I’d love ya for it, I really would. Love your party...you entertain the way I like to: comforting foods that showcase pristine ingredients! You're right...luxury comes in all forms and all doesn't have to cost an arm and a leg. I'd love to come to a dinner party at your house! Well done...can't wait to vote for you on Monday! Everything looks wonderful. I think comfort is a luxury we can all afford. Love the post! Beautiful stuff, Foy! I definitely would've liked to RSVP to your table! Well done and good luck! AWESOME job with your dinner party. I would love to be a guest at your table any day! You did a great job with the presentation, even rolling up the pasta into balls. I love it! This looks beautiful! I love how you showcase foods that are in season. Eating local, seasonal foods is definitely my idea of a luxurious dinner. Congrats! Yum. I'll definitely vote for you. Your dinner party looked wonderful. I really get the feeling of the season with your presentation and cooking. Everything looks delicious, especially the chowder. YUM! Seasonal, fresh, and amazing. Bravo! Wow your pictures are really beautiful and I love your simple elegant recipes. Thanks for sharing, and good luck in project food blog! There is nothing better than celebrating with fresh local foods. I love that you made recipes that can be made in advance so you too can enjoy the party. Everything looks delicious, nice job! Can I get an invite!!! Everything sounds delish and so "autumn." Nice job! Looks Great! 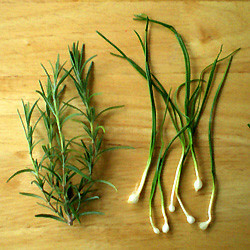 I will definitely be trying the Onion and Rosemary Bread as I have a ton of rosemary in my garden still. Your photos are incredible! And the menu just looks delicious. Only thing I'd have to pass on is mushrooms (sorry, just can't eat the things). Everything else? Yum! Glad you had a wonderful time with a great meal and friends. This is my type of food so you get my vote. What a beautiful dinner party! Sounds great! Hope we both make it to the next round! :-) You have my vote! Foy - This is such a beautiful post! Always lovely and educational. I love your pictures. Great post and you got my vote. Good luck! Everything looks delicious. I've never tried hickory nuts before...I don't think they're available in my area. 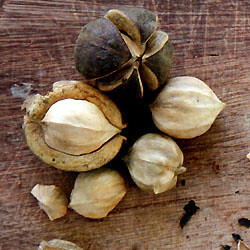 We're hazelnut people in these parts :) Beautiful post! Foy, this is beautiful. You've stayed true to using local and seasonal ingredients. Voted!! It all looks so amazing! Great job! Good luck on going to the next round! What a yummy menu!!! Good luck! Wow, beautiful photos and I love all the fresh flavors! Headed off to vote! I love a good corn chowder!